This is the first day of our American road trip. We started out by taking the bus from Bandon to Portland, Oregon. Portland seems like a big reading city. The weather was perfect and I saw people sitting outside with paperbacks all over town. 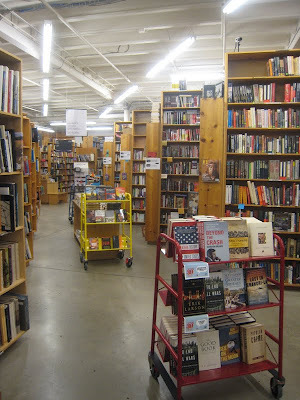 We made an important pilgrimage to the renowned Powell's Books. I think I could spend all day there, and it might be worth a trip to Portland just to see the exhaustive travel writing collection. Tomorrow we're renting a car and taking off into the great unknown. We're heading east. I'll try to keep you updated on the bits of literary culture that I see as our road trip progresses, and I'll be collecting titles all over the country for this week's bookspotting post. My regular Hong Kong posts will be back when I return to Asia in mid-August. A "pilgrimage to Powell's" is exactly the right way to put it! I hope to make my own pilgrimage to this bookstore someday. Spend all day there? I could live there!